Ace pilot and military man James Rupert “Rhodey” Rhodes has been a popular and reliable presence in both the Marvel Cinematic Universe movies and the Iron Man comic books. As Tony Stark's best friend and personal pilot, it would be easy to dismiss him as a second fiddle character, but Rhodey has become an integral part of Stark's life as well as a strong character and hero on his own merits, becoming the awesome War Machine. Don Cheadle makes his fourth MCU appearance as Rhodes with his role in Captain America: Civil War. Despite a handful of appearances in the movies and decades of comic book adventures, how much is actually known about the man behind the uniform behind the armor? Here are ScreenRant's 14 Things You Didn't Know About War Machine. This should be obvious to anyone with basic facial recognition skills, but Don Cheadle only picked up character duties in Iron Man 2. Terrence Howard originally played the role of James Rhodes in 2008's Iron Man. Whilst people liked Howard's comic timing and personality as Rhodey, the actor ended up not reprising his role in the sequel. Howard was the first actor cast in Iron Man and he was apparently signed up for three films. Due to early contract negotiations and the now laughably antiquated idea that Robert Downey Jr. was a risk, Howard ended up being the highest paid actor in the first film. Thanks to the wild success of Iron Man, a sequel was fasttracked and Howard was dropped from the burgeoning franchise. There have been many rumors as to why Howard was booted so unceremoniously, and nearly all of them revolve around a dispute over salary. Marvel also seemed to be in a rush to get everything sorted for the sequel, with Don Cheadle stating he was basically cast overnight, as he was given a few hours to sign on the dotted line. 13 In an early draft of the first Iron Man movie, Tony's father Howard Stark was the main villain, calling himself "War Machine"
2008's Iron Man set the blueprint for how the Marvel Cinematic Universe would operate. It was a faithful take on the character and introduced the world of Tony Stark to a mass worldwide audience. However, in early versions of the script, Howard Stark, the deceased inventor father of Tony, was still alive, and was written as the main antagonist of the film. Interestingly, Stark Sr. chose “War Machine” as his dastardly villain name. This was probably meant as a mere reference to the character, but it's interesting to speculate on how this would have changed things, especially as the loss of his parents has been one of the main motivations for the character in the movies since, even playing a significant part in Captain America: Civil War. Thankfully, this idea was scrapped in favor of making longtime comic villain Obadiah Stane (Jeffrey Bridges) the big bad, and Tony's feelings towards his parents were kept intact. Don Cheadle seems like an unflappable kind of guy, but apparently the long hours filming in the War Machine suit started to get to him, leading him to take anti-anxiety medication to help with his claustrophobia. Cheadle was quoted as saying, “You feel like a turtle. It's big, it's heavy, it's constricting, you can't touch your face, your arms don't articulate all the way...I took all kinds of things (to cope with the anxiety because it's) very claustrophobic." He joked that the reason Downey Jr.'s suit was lighter than his was down to racism and said that whilst it was hanging in the costume department, it had a label reading "burden" on it. This could be one of the reasons why the Iron Man suits in the newer films are almost entirely CGI creations, with only a few place markers here and there to help the CGI artists accurately render the armor. James Rhodes debuted in January 1979 in Iron Man #118, but he was a ways off from the badass character we know and love back then. He was background presence for the most part, fulfilling the role of Tony's personal mechanic. However, Rhodey was finally given more depth and a backstory in Iron Man #144 with the story Apocalypse Then, where Tony Stark reminisces about the first time he met Rhodey in the Vietnamese jungles. Lieutenant Rhodes' helicopter was shot down and he ended up stranded behind enemy lines. He ends up meeting Tony Stark, fresh from escaping capture using his prototype armor, and the two teamed up to defeat Stark's pursuers and to destroy the enemy base that shot Rhodey down. They blow up the base and escape with a stolen enemy helicopter. Impressed and grateful, Stark offered him a job as his pilot, but it wasn't until after the war that Rhodey accepted. Later comics have updated this to the much more recent Afghanistan war, but the core reasons as to why the two men became close friends remain the same. Since they met, Jim Rhodes had generally been by Stark's side through thick and thin. This was especially true when Stark relapsed into alcoholism due to slowly losing his business and being dumped. In the Blackout story in Iron Man #169, Stark suits up and goes on a superpowered bender, flying drunk through billboards in Times Square. He proves too wasted to defeat the villain Magma, and returns to his penthouse. There he sees Rhodey and accidentally reveals that he's Iron Man and that Magma is on his way. Rhodes dons the armor himself, and, after struggling to get to grips with the suit, eventually manages to defeat Magma. After Magma is beaten, Stark refuses to suit up as Iron Man again and leaves Rhodey in possession of the armor and his factory. As his first act as Iron Man, Rhodey calls up the Avengers and quits the team. Rhodey would continue as Iron Man for two years and go on to fight some of Iron Man's classic foes, including the Mandarin. There have almost been more versions of The Avengers than superheroes to populate them. The West Coast Avengers is one of the more interesting splinter groups. The team is founded by Hawkeye, who wants to expand the Avengers' influence and moves from New York to Los Angeles. He forms a group consisting of himself, Mockingbird, Wonder Man, Tigra and Iron Man. However, what Hawkeye and the rest of the group don't know is that it's James Rhodes in the suit, not Tony. This leads to an interesting team dynamic, as Rhodes struggles to keep his identity secret. In West Coast Avengers #4, the team faces off against the supervillain Gravitron. Iron Man becomes impatient and votes to attack Gravitron head-on. Hawkeye shuts him down and says that he should remember how dangerous Gravitron is from their Avenger days. It's at this point that Rhodes reveals his identity to the team, leaving Hawkeye shocked and angry. They eventually settle their differences and work together to defeat Gravitron, their first victory as the new team. When he first took on the Iron Man suit and name, Rhodey did well and held his own against the arm's length list of bad guys that wanted to punch Iron Man in his metal face. However, as his term went on, Rhodes started acting strangely, becoming more aggressive and reckless. As Tony Stark started to climb out from the bottom of the bottle, he began to put his life back in order, and Rhodey became increasingly paranoid that Stark was working up to try and take the armor back. It turns out that since the Iron Man suit was tailored for Stark's brain waves, it was having an adverse effect on Rhodey, giving him headaches and negatively affecting his personality, making him resent and hate Tony. Things came to a head in Iron Man #192 when Rhodey went on an angry and collateral damage-filled rampage in an attempt to bring in supervillain Vibro, leading Stark to finally face up to his heroic responsibilities, put on a prototype Iron Man suit and fly into action to stop ol' raging Rhodey. Stark dons the War Machine armor and defeats The Masters of Silence at the cost of his health. Tony appears to die, leaving Rhodes the CEO position at Stark Enterprises and a custom War Machine suit to carry on Iron Man's legacy. When it turns out that Tony faked it and was merely in a cryogenic state, Rhodes becomes understandably angry that Tony didn't tell him to spare his grieving, and he quits his position at the top of the corporation. It also caused a large rift in their friendship and prompted Rhodes to take the War Machine suit and rejoin the West Coast Avengers, away from Tony's lies. As War Machine stepped out on his own, he was soon embroiled in all new adventures. Whilst investigating some Neo-Nazis, a plot is soon discovered that involves the Neo-Nazis sending modern weapons back in time to World War II to their German Nazi counterparts in an attempt to change history. Rhodey's suitless stint didn't last long. His fishing vacation is rudely interrupted by a mystery woman named Skye, who states she can lead him to the location of an alien suit. Rhodes is attacked by vicious alien beast called a Lictor and ends up donning the suit to defeat it. He soon learns that the suit is Eidolon Warwear, an ancient alien armor made by the ostensibly extinct Eidolon race. The suit is sentient and adaptable, changing its functions to meet the need of the wearer. It functions in a similar way to Spider-Man's symbiote suit, bonding with the host, granting boosted powers and teh ability to heal itself and the wearer. Its full suite of powers were never discovered, but it had the ability to create any kind of weapon Rhodes could imagine, as well as being able to create a number of psychically linked drones to aid in battle. When not in use, it conceals itself as a tattoo-like marking on Rhodes' chest. Oddly, the suit had the ability to “sing” and would blast out ancient alien war chants whilst Rhodes was fighting. The Eidolon Warwear became a literal and figurative part of Rhodes. As we're dealing with mid '90s comic book lore, this may get obnoxiously over-complicated, but bear with us. At the time, Tony Stark was under the control of Kang the Conqueror, who later turned out to be a villain named Immortus in disguise. Under Immortus' control, Stark had killed several heroes. Rhodey had been chosen by the armor to defeat Stark. The Avengers recruit a teenage Tony Stark from an alternate timeline and recruit him for battle. When the two Tonys finally meet, adult Tony eventually manages to break free of Immortus' control and sacrifices himself so that teen Tony may live and so that Rhodes can ultimately defeat Immortus. Rhodey joins Stark Enterprises to protect Tony's legacy whilst the corporation is bought out and taken over by Japanese conglomerate Fujikawa Industries. Rhodey learns that Fujikawa Industries are interested in Stark's armors, and so Rhodes infiltrates Stark-Fujikawa's mainframe and sacrifices the Eidolon Warwear in order for it to mesh with the servers and wipe all traces of Stark's armors from the system. Rhodey then retired to start his own marine salvage company. The '90s were a weird time in comics. Unfortunately, Rhodey's marine salvage business left him bankrupt, thanks in part to his wild spending and trusting of a crooked accountant. If that wasn't bad enough, Rhodes got the news of his sister's murder soon after. He travels to a notoriously crime-ridden area of Brooklyn called “Little Mogadishu” or “The Mog” for short, where he starts looking for answers and takes the fight to the gangs. He's helped by a man named Josiah X, and Rhodes captures the murderer responsible. Realising the problem goes deeper than one murderer, Rhodes and Josiah X team up, and with the addition of other superpowereds Junta and White Tiger, they nickname themselves “The Crew” and start all-out warfare on the 66 Bridges, the biggest and most dangerous gang in the area. Marvel cancelled the series after the seventh issue, and Jim Rhodes returned to his standard life. The more recent comics have emphasised Rhodes' ties with the military and the Air Force more. In the events leading up to The Initiative story arc, Rhodes is attacked by terrorists in Dubai whilst testing fighter jets and crashes horribly. The attack leaves Rhodes in a bad way, costing him the use of all four limbs and disfiguring his face. Stark rebuilds him using high tech cybernetic replacements, and Rhodey becomes a cyborg. Given no other choice, Jim becomes War Machine again. Rhodey was made a commander and entrusted to oversee The Initiative, a post Civil War/Superhero Registration Act move to have heroes in all 50 states of America. Whilst Rhodes lay in a hospital bed after the terrorist attack, his ex-girlfriend, Bethany Cabe, went about creating a genetic clone of Jim with the ultimate goal of switching his consciousness into the clone body when ready. However, Norman Osborn discovered the facility where clone Rhodey was being kept, and took the body for the purposes of blackmail. The cyborg War Machine ended up saving a child from Norman Osborn's attacks, dying in the process. However, just as he died, Suzanne Endo aka the superheroine Cybermancer transferred his consciousness into the waiting clone body, and Rhodes woke up as a 100% flesh and blood human once again. The human Rhodes soon acquired a new version of the War Machine suit and was set back on the path of superheroics. 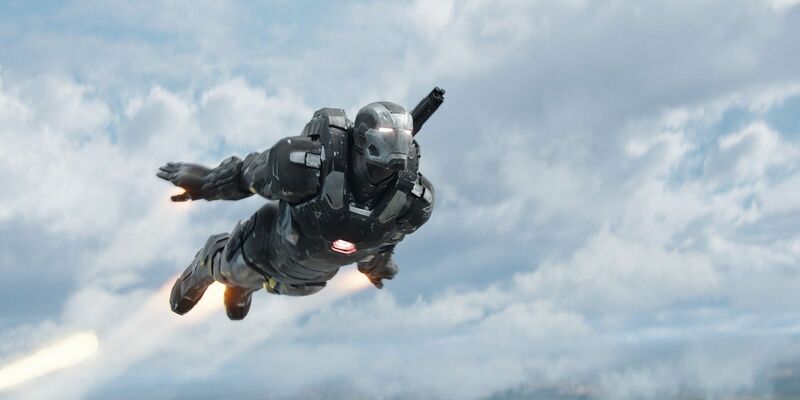 What did you think of War Machine in Civil War? Sound off in the comments section.